The short run, long run and very long run are different time periods in economics. Short run – where one factor of production (e.g. capital) is fixed. This is a time period of fewer than six months. Very long run – Where all factors of production are variable, and additional factors outside the control of firm can change, e.g. technology, government policy. Several years. Therefore in the short run, we can get diminishing marginal returns, and marginal costs may start to increase quickly. Also, in the short run, we can see prices and wages out of equilibrium, e.g. a sudden rise in demand, may lead to higher prices, but firms don’t have the capacity to respond and increase supply. We have time to build a bigger factory. Firms can enter or leave a market. Prices have time to adjust. For example, we may get a temporary surge in prices, but in the long-run, supply will increase to meet it. Price elasticity of demand can vary – e.g. over time, people may become more sensitive to price changes, in short run, people keep buying a good they are used to. This shows how a firm’s long-run average costs are influenced by different short-run average costs curves. 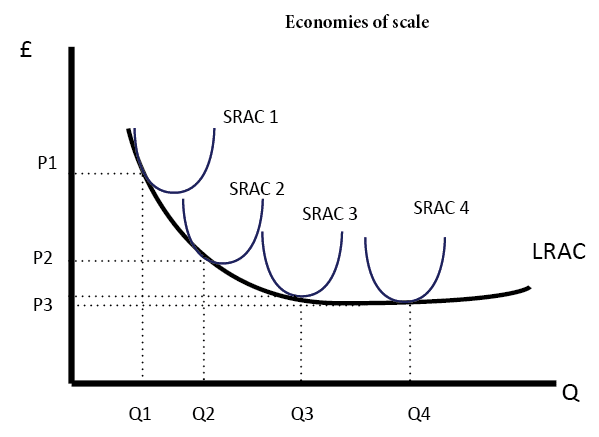 The SRAC is u-shaped because of diminishing returns in the short run. New technology may make current working processes outdated, e.g. rise of the internet and digital downloads have changed the fate of music industry, making it hard to make a profit from selling singles. Government policy may change, e.g. reducing the power of trades unions has reformed the UK labour market. Social change. For example, the First World War brought more women into the labour market and changed people’s expectations about the jobs women could do. We can also see the short run and long run in macroeconomics. For example, the difference between short-run aggregate supply and long-run aggregate supply.